To the right of the fountain is a house you can go inside. At the back is a band of Wilikin who'd like Shield Shredder to complete his Quest Wood-Be Band with them. A few coins reward along with the evolution. Outside head along the path and immediately take a right around the corner to another building. In here is the level's Story Scroll. There's also a big red button underneath the crates on the left, stepping on it will open a gate inside another building across the street. You can go straight across to that building now. Now that you've pressed the button in the other building the gate in here is down and you can get Treasure Chest 1/3. Outside there's a block puzzle to do, push the left block to the right twice and then the other one into place just past it. Jump up onto them and push the top block off to complete the pipe. On the left of Conlan is a house to go into. Although there's nothing in here, it's just for the all areas. And far behind Conlan you should be able to see an Undead Elemental Gate. Wander down the slope and into the cave. Through to the right you'll be ambushed by a few Shield Shredders. Once that's through the next room will have a few more Shield Shredders and a few of the cannon Evilikins and then the third and final room has an added Scrap Shooter attacking you. After completing that room you can get Hat 1/2 - Clown Bowler Hat. Pull the lever next to Conlan to open up the tracks, a few Shield Shredders will start arriving on the carts. Move along the tracks between the carts as the cowcatcher on the front will damage you if you get hit by it. Keep ducking into the alcoves at the side (or perhaps try jumping over the carts) and defeating the enemies as you move towards the end of the tracks. The first few enemies that appear are some spinning Evilikin, these are similar to the spinning enemies of previous games in that they are invulnerable while they are spinning so get out of their way! Once the first wave is over a second wave will arrive, when they are wiped out the Fire villain Scrap Shooter. You've fought several regular versions of him before but he has a bit more health than them. The platform in the middle can protect you from his wider burst (which he'll do three times in a row rather than the once the others do) but not the focusing firing attack (neither does the door next to him), so get to avoiding the attacks and take him down! 1100 coins and a Skystone. Go through the opened monster gate. Just to the right now you can see a small wooden fence along the edge of the platform, jump over it down to a platform below where Soul Gem 1/2 - Fling Kong is found. Bounce back up, jump up the stepped platform along the left side of the tracks and then onto the back of the train before it moves off, stay on there waiting. Jump off the train when it reaches the end and pick up the Legendary Treasure - Legendary Masterpieces, as far as I can tell all that's behind the Traptanium Crystal is a few coins. Down to the left is a Magic Elemental Gate. A really pointless area, walk forwards to get Hat 2/2 - Lil' Elf Hat. Bounce up to the left to get back to the tracks, a little further along to the right is a building to go in. Yoho at the back would like you to use Scrap Shooter to fix their Skystones Smash table for his Quest Pirates of the Broken Table. So if you caught him just now it's time to evolve him already! And yes, you can play a game of Skystones Smash with him once you've completed the quest, he rewards 1500 coins. Use the train to get over to the other side of the track and then another one to get to the back right area. A couple of Shield Shredders will attack, they'll be followed by another pair and a Scrap Shooter in the corner. Once you've got rid of all of them go into the houses. Smash down the crates and you can find the Winged Sapphire behind them along with Yar Har who has an optional game of Skystones Smash to play for a 1500 coin reward. Rochester has a Quest for Dreamcatcher, Sweet Dreams, make sure you stand back otherwise you'll trigger a glitch where you're teleported before the conversation is finished and the quest won't work. Use the train to get up to Kaos, use the extra car at the back for extra height, and go inside. Go left along the conveyor belts and then take down a group of those spinning Evilikin, behind them is a Villain Stash and next to that is a Traptanium Crystal with Treasure Chest 2/3 behind. Use the bounce pad that defeating the spinners unlocked and run along the upper conveyor to Persephone. Drop down following the path of coins and keep following the conveyor belt to the right. Towards the end there's a moving drill to avoid as you get off the belt. Bounce up a few times and you'll reach a closed monster gate, to open it up you'll have to go off from the central section of the conveyor belt and press a big red button. Go open that Treasure Chest 3/3. At the right end of the conveyor belt there's a pair of drills this time, bounce up between them. To the left at the top is a Traptanium Crystal with Soul Gem 2/2 - Head Rush inside. As you cross the next conveyor don't bother smashing the boxes, they just have mines inside that'll damage you. Defeat a few enemies next to the next monster gate and then walk along the longer conveyor belt avoiding the boxes as they too have mines inside. Pull the lever and go up the ramp towards a Kaos speaker. Go over to the crane machine and drop a bomb on each of the green glowing walls. Once they're all down go through and outside. There's a few Shield Shredders up the slope, after them go through to a few more along with a large Krankenstein. Go through the gap and once all the enemies are dead another gap will open up to let you through to the last fight of the level. The battle is against the Tech villain Dr. Krankcase, the first stage of the fight involves Dr. Krankcase jumping down (avoid the red circle) and then spinning around trying to hit you, attack him back when he pauses. Until you get enough health down he'll keep repeating that. The second part will turn the corners into goo and start up the conveyor belts so they're pushing barrels into them. Any barrels that fall in (you can hit them before they do) turn into little green enemies that don't take much damage to destroy (and often drop food so you might find it better to let the barrels fall in). After the top belts turn away Dr. Krankcase will jump down and repeat a similar situation as the first stage, some more barrels will get put in while you're doing this. After showing Kaos to you the area will get blasted with goo from the sky so move out of the way of the dots when they appear. Keep on dodging those as more barrels are formed, keep on doing that until the next part starts. Dr. Krankcase will create a new Evilikin enemy to beat up, this one is melee who punches twice each attack. Defeat him to get onto the next part of the fight. The part after Wolfgang appears adds a grinding column and a new conveyor belt, if you trick Dr. Krankcase into going onto it you can get it to hurt him instead. He'll jump away shortly and then introduce another copy of that new Evilikin and also start up the goo drops to avoid. You'll want to trick them both into going into the grider again. This is the final stage, he'll earn you 2500 coins and a Skystone (with a pretty cool power) to finish the level. A new tower will appear but nothing to can do anything with. The Legendary Masterpieces are found by the fireplace in the Main Hall. And that's all that's new here this time, straight off to Time Town. 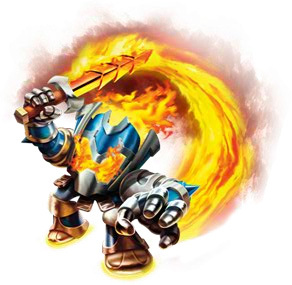 Spy Rise would make for a good candidate Skylander against Dr. Krankcase.